Myanmar, officially the Republic of the Union of Myanmar and also known as Burma, is a sovereign state in South East Asia bordered by Bangladesh, India, China, Laos and Thailand. One-third of Myanmar's total perimeter of 1,930 km (1,200 miles) forms an uninterrupted coastline along the Bay of Bengal and the Andaman Sea. The country's 2014 census revealed a much lower population than expected, with 51 million people recorded. Myanmar is 676,578 square kilometres (261,227 sq mi) in size. Its capital city is Naypyidaw and its largest city is Yangon (Rangoon). Bangladesh (193 km) and India (1463 km). Coast line : 1930 km surrounded by the Andaman Sea at the Bay of Bengal. No vaccinations are officially required for a visit to Myanmar. Strongly recommended is Malaria prophylaxis. Vaccinations against Polio, Tetanus and Hepatitis are also recommended. The Cuisine of Myanmar is influenced by the cuisine of neighboring Thailand and China also Indian recipes are found on the menu. Drink only bottled water. Not recommendation to eat raw vegetables. Main electricity supply is 220-230 v / 50 Hz. The Central Post Office located at the corner of Bo-Aung Kyaw Street and Strand Road in Yangon. Operates from 9:30 am to 4:30 p.m. Available to makes international calls, telexes and faxes in the nearly almost of the major tour sites. Government and business: 9:30 am to 4:30pm. Monday through Saturday. Cotton clothing and a light wrap for the evenings during the cool season are recommended. Please to be avoid wearing shorts, tank tops or sleeveless blouses when visiting Pagodas and temples. Footwear is strictly prohibited in pagodas and monasteries. All the times dress modestly. Myanmar Standard time (MST) is 6:30 hours ahead of Greenwich Mean Time (GMT/ UTC). A valid passport with Entry Visa is required of all visitors. All visitors, including children above 7 years old, require a visa in order to enter into the country. A Tourist visa allows a stay of 28 days, extendible for an additional 14 days. A Business visa allows a stays of 28 days, extendible up to 12 months on case-by-case basis. Visas On Arrival is granted on prior arrangement with the Ministry of Hotels and Tourism. Visa - on - arrival : can be granted 10 days before departure. We will need your personal detail to apply visa on arrival. Information includes: passport details as such as Full Name, Passport No, Nationality, date of birth and Profession, passport date of isse/expiration. Two passport photos necessary upon arrival in Yangon. Due to economic sanctions from most western countries, international flights into Myanmar are limited. The usual way to get into Myanmar would be to fly into Yangon from either Bangkok or Singapore, both which have good connections from around the world and have several flights into Yangon daily. As from the 4th of October 2012 Qatar Airways flies direct from Doha to Yangon and return three a week. The only other international point of entry to Myanmar is Mandalay, which is served by a weekly flight to/from Kunming. * Myanmar Airways International flies from Yangon to Bangkok, Kuala Lumpur, Hanoi, Siem Reap, Phnom-Penh, Guangzhou and Singapore. * Bangkok Airways has one daily flight from Bangkok to Yangon and one daily return flight, costing from 3500 baht. * Thai Airways International flies Bangkok to Yangon and back 2-3 times daily from 3500 baht one-way. * Malaysia Airlines flies between Kuala Lumpur and Yangon 5 times a week. * Air Bagan flies from Yangon to Bangkok and Chiang Mai. * China Airlines links Yangon with Taipei. * Silk Air links Yangon with Singapore twice daily, with an additional third flight on Fridays and Sundays. * Jetstar, the low-cost subsidiary of Qantas, links Yangon with Singapore 4 times a week. * China Southern Airlines links Yangon with Guangzhou twice a week. * China Eastern Airlines links Yangon with Kunming daily, and Mandalay with Kunming three times a week. * Vietnam Airlines links Yangon with Hanoi everyday. * Asiana Airlines links Yangon with Seoul twice a week. Qatar Airways links Doha to Yangon direct three times a week. NOTE: There is a US$10 exit fee, to be paid before you check in for your flight out of Myanmar. The fee is paid at a dedicated counter inside the Yangon International airport. Do not forget to ask for the receipt of your payment (blue paper): without this receipt, you cannot check in for your flight. If you're flying with AirAsia, the US$10 exit fee is already included in the flight ticket. Hopping across the Thai border into Myanmar's border towns is easy, but crossing into or out of Myanmar proper by land varies between difficult and impossible. Visa-free entry is possible at some border crossings, but you must then exit Myanmar via the same border crossing, usually (but not always) on the same day that you enter, and fees apply (normally US$10). All land border crossings into Myanmar give only restricted access to the border areas. The only way to visit locations throughout the country, is to enter and exit Myanmar by air. * Tachileik / Mae Sai - foreigners can access this crossing from either side, and enter and/or exit either country here. As of March 2007, travel beyond Kengtung to the rest of Myanmar is not possible, even with a valid tourist visa (can however visit Mongla, but this has become more respectable as the Chinese casinos have cleaned up their act). Travellers wishing to exit Myanmar at Tachileik can only do so with a permit from the MTT office in Yangon. * Myawaddy / Mae Sot - foreigners can only access this crossing from the Thai side; neither onward travel into Myanmar (ie beyond the border town) nor overnight stays are possible. No visa needed; instead there's an entry stamp fee - US$10 if paid with US$ notes, more (500 baht) if paid with Thai currency. As of August 2009, only Thai baht is accepted. * Three Pagodas Pass (Payathonzu / Sangkhlaburi) - foreigners can only access this crossing from the Thai side; onward travel into Myanmar (ie beyond the border town) is not possible; entry/exit stamps are NOT issued here, and foreigners passports are held at the Myanmar checkpoint, where a fee is levied - US$10 if paid with US$ notes, more (500 baht) if paid with Thai currency. However, as of November 25, 2008, this crossing is temporarily closed. Note: It was reopened in December 2010. * Kawthoung / Ranong - foreigners can access this crossing from either side, and enter and/or exit either country here. If entering without a visa, maximum stay is 3 days / 2 nights, travel beyond Kawthoung is not permitted, and there's an entry stamp fee - US$10 if paid with US$ notes, more (500 baht) if paid with Thai currency. As of March 2007, the only way to continue onward from here appears to be by plane to Mergui or Yangon, although there have previously been ferries on these routes as well. China - foreigners can enter Myanmar at Lashio via Ruili (in Yunnan), although a permit (as well as a visa) and a guide are needed. You will most likely need to join an organized tour, costing 1450 RMB as of January 2009. As of April 2009, it is impossible for foriegners to cross over from Ruili, even for the day, without first getting a visa in Kunming, ie a tour group. Crossing in the opposite direction is more difficult to arrange and details are uncertain; however, it's possible to fly from Mandalay to Kunming, and there's even a Chinese consulate that issues visas in Mandalay. India - a land border crossing exists between India and Myanmar at Moreh/Tamu. While there have been confirmed reports of some travellers crossing into Myanmar from India, with their own transport as well as with permits arranged in advance, the general consensus is that obtaining all the necessary permits is very hard. At the least, a foreign (a person who is neither a citizen of India nor a citizen of Myanmar) will need to get an Indian permit to visit the state of Manipur, and an MTT permit to enter or leave Myanmar at Tamu. Travellers may also need a permit to travel from Tamu to Kalewa, although there are unconfirmed reports that this is no longer required. Bangladesh / Laos - it is not currently feasible to independently cross the borders between Myanmar and Bangladesh or Laos. Myanmar has three district seasons; winter, summer and the monsoon season. Burma has three distinct seasons, with the hottest and driest running from February to May. During this time, temperatures can reach up to 40 degrees Celsius, although relief can be found in the highland areas which, on average, clock cooler temperatures. The monsoon season runs from May to October, while milder and drier weather usually prevails from October to February. During the rainy season, its mainly rains in the Coastal and the delta region, even through there are many days of Clear blue skies and the landscapes are green and lush. During this period, Central and Upper Myanmar including Mandalay, Bagan and Inle Lake are relatively free from rain. Major Races are Bamar, Kachin, Kayah, Kayin, Chin, Mon, Rakhine and Shan. A Union of over 100 nationalities. Languages: Myanmar Languages is the Official language. The major races have their own languages and dialects. English language is widely spoken and understand. When addressing people, don’t leave out U (which stands for Mr) or Daw (which stands for Ms/Mrs). Not always necessary to shake hands. Don’t hug or kiss in public. Don’t touch any adult on the head. Don’t step over any part of a person, as it is considered rude. Accept or give things with your right hand. In Myanmar, unlike the Indian continent, nodding means YES, and shaking head means NO. For hygiene reasons, eat only in decent restaurants. When not available, always eat heated food. Don’t eat food purchased form street vendors. Drink only bottle d water and soft drinks that haven’t been opened yet. Let the oldest be served first. Chinese food is common and suggested. To try good Myanmar food, go to decent restaurants in Yangon area, where they cook Myanmar food according to international standards. When buying gems, sculptures, or any expensive souvenir, make sure it comes with and export permit. Buy arts from authorized dealers only and get a certified receipt. Don’t leave expensive items in your room. Use safe deposit box. Beware of cheats, swindlers, imposters. Stay away from narcotic drugs. Carry some medicines for diarrhea. If sick, don’t worry. All doctors are English literate. Health insurance is not available. Accept that facilities may not be the best. On trains, keep windows shut. Speed or distance descriptions are in miles, not kilometers. Carry toilet paper in your bag. Most Myanmar do not wear shoes in their homes. Take off when visiting. Don’t jays walk? Watch where you walk and what you step on. If driving, city speed limit is 30 mph. Drive on the right side. At religious places, remove footwear, but to remove headwear is not necessary. Avoid being a nuisance when taking photographs. Treat Buddha images with respect. Tuck away your feet. Don’t point it toward the pagoda or a monk. Don’t play loud music in these areas. Note that Buddhist monks are not allowed to listen to music. Do not put Buddha status or images on the floor or somewhere in appropriate. Don’t touch sacred objects with disrespect. Hold them in your right-hand, or with both hands. Leave a donation when possible. Show respect to monks, nuns, and novices (even if they are children). Don’t offer your hand to shake hands with a monk. Sit lower than a monk and elders. Don’t offer food to a monk, nun, or a novice after noon time. A woman should not touch a monk. Myanmar / Burma Videos: view amazign videos about Myanmar Country and People. Most updated Videos. 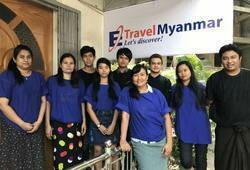 Follow us on . . . . . .
E-Travel Myanmar Co.,Ltd 9.8 out of 10 based on 785 votes.